The main temple of Khong Chiam is on a hill overlooking the city. The temple grounds contain beautifully maintained gardens, as well as perplexing mountains of exceedingly gnarly tree roots. For me, though, the main attraction is the enormous temple gong erected at one end of the car park. 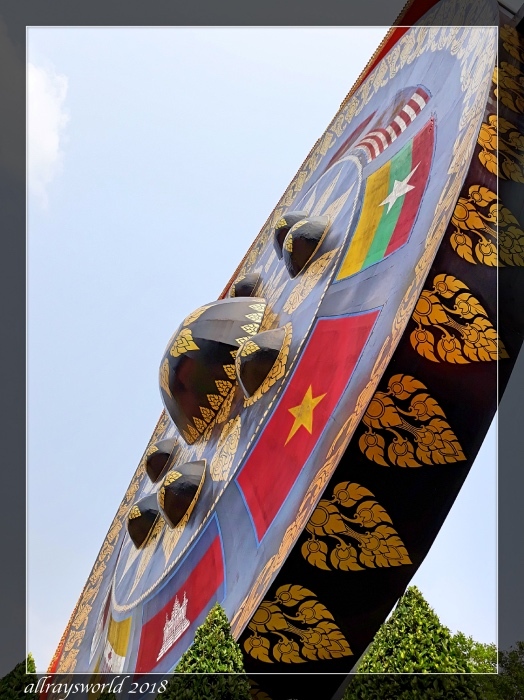 This steel monstrosity is about 20 metres in diameter, and has clearly just recently been repainted, and decorated with the the flags of the 11 Nations comprising the SE Asian Economic Community. C'est très beau avec tous ces drapeaux. Ray: La collection de drapeaux avait l'air plutôt bien, Martine. I just love this thing! Great photo's an info! Ray: A unique object, Elizabeth. Ray: I couldn't find a beater, Frank, or would certainly have given it a whack. Hard to get all that in one image! Just enormous. I like the display of the flags...wonderful piece. Ray: It was surprisingly attractive, Bonnie. That is one vast erection Ray. I wonder if somebody took a swipe with a large mallet what tenor of sound it would produce? Probably sufficient to dislodge the monkeys out of the trees for miles around..
1. All the elephants in Asia would stampede towards the temple. 2. All the Great whales would beach themselves and start hitchhiking towards the temple. 3. The Russian and USA arsenals of nuclear missiles would auto-launch. 4. POTUS 45 would claim credit for the sound. Impressionnant ....c'est vraiment de beau travail. Ray: Il a été confectionné et décoré avec compétence, Claudine. It's hard NOT to be impressed by what is surely the world's largest gong, Ray. OMG. Who comes up with these things! Ray: It certainly got my attention, Ginnie. Ray: I remember that Rank bloke whacking the big gong, Alan. I am wearing long trousers more often these days so I can get a bit of a rest from mobs of nubile young gals who seem incapable of resisting the compulsion to be stroking my bare legs...that's what you were thinking...right? This is amazing, Ray. That is quite some engineering here, for that stands tall and they must have figured out "where the wind comes from". Ray: I did wonder if the wind had been taken into account when this enormous thing was stood up, Astrid. I am just hoping that it does not fall on your head Ray. This trip seems to be fraught with constant dangers. Ray: Flirting with death/dismemberment at every step, Chad. you add the scale of the gong well with your presence, Ray. i find it a bit odd to see the ASEAN flags on it though. Ray: I don't know the story about the flags, Ayush, but did wonder if a meeting of that Body might have taken place here. Wonderful images, esp. the second one, and I am sure this 'steel monstrosity' will sound beautiful if hit by a clapper. Ray: I looked for something to strike it with, Philine, but all possible clappers seem to have been hidden prior to my arrival. Ray: I come across strange and wonderful things like this quite often in Thailand, Lisl. I first thought "Well hung" as you are fearlessly standing right below it. But then I noticed that it is properly erected in the little park behind you, so it is not actually well hung. Ray: That is not an epithet that is commonly used in reference to me, Louis. It is a beautiful and amazing structure, I gather you didn't get a go. Ray: I think they hid the hammer when they saw the gleam in my eye, Brian. I want to see the thing they bong it with. Ray: Perhaps a hammer like the one Thor uses, Bill. > It looks so vibrant. My favourite image is the tilted one up-close. Ray: I believe it is freshly painted, Jacquelyn. Now all you need is a 40-meter mallet! Ray: ...or, or one those flying ones Thor uses, Larry.